Look closely at the picture below. Notice anything? Probably not. It’s an altogether uninspiring (let alone not particularly well framed) picture, taken yesterday afternoon, of a group of people hanging out at one of Ubud’s busiest intersections – where Jalan Raya (Main St) meets Jalan Suweta. The entrance to the Royal Palace, home to one of Bali’s wealthiest families, lies over my right shoulder. It reminds me of a video that went viral a few years ago: A study on selective attention illustrated how that which doesn’t ‘belong’ in a given situation will often remain unobserved by people, even if it passes right in front of their eyes. The presence of something that doesn’t ‘fit’ into a given scenario will go largely unnoticed because viewers are focused on – or distracted by – the ‘main’ event, to the exclusion of everything else. The scene in my photograph, with its abundance of sights (and to those in the frame), sounds and smells, overshadows a quiet and unobtrusive presence that remains unnoticed by most tourists – partly, no doubt, because it’s a corner that buzzes with activity, touts peddling tickets to this evening’s dance performance, drivers calling out TAXI(!!) and motorbikes turning corners so quickly they nearly mow down pedestrians. The cacophony blocks out what might otherwise be seen if people slowed down, stopped talking – and quietly observed. But I chose to believe them because it was too disturbing to think otherwise. Last night, as I left Betelnut (where Hubud’s Pecha Kucha monthly event had just wrapped up), and walked by Casa Luna, the beam from a street light caught my eye. As I traced its path down to the sidewalk, the rays landed on what looked like a bundle of rags. 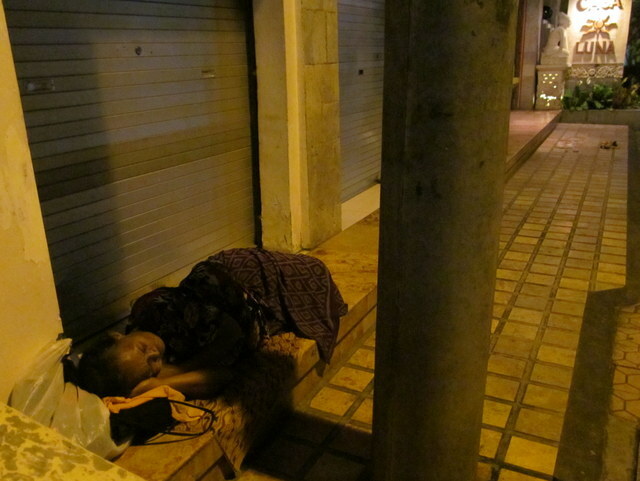 There she was, the bag lady, asleep on a step in front of a shuttered shop. 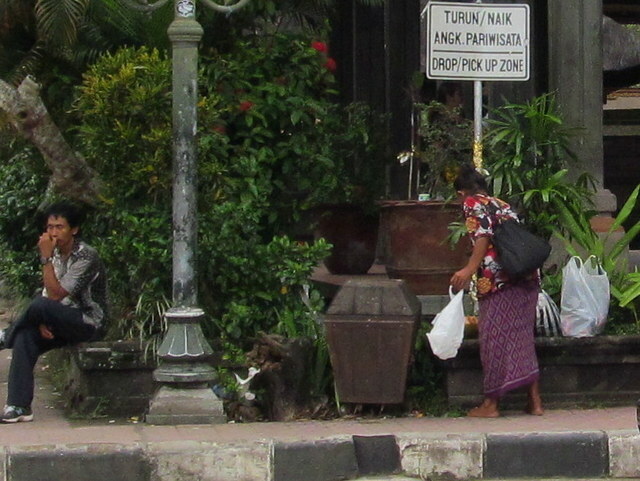 I’m not sure whom one approaches to ask why a Balinese woman is alone, destitute and living on the streets of Ubud; the tourist police? The Royal family? The chief of Ubud’s traditional village organization? An NGO? A pedanda (high priest)? I don’t know. But, now armed with picture-perfect proof, and puzzled as I am about where her angels are and what they’re up to… I’m likely to keep asking around until I find out. 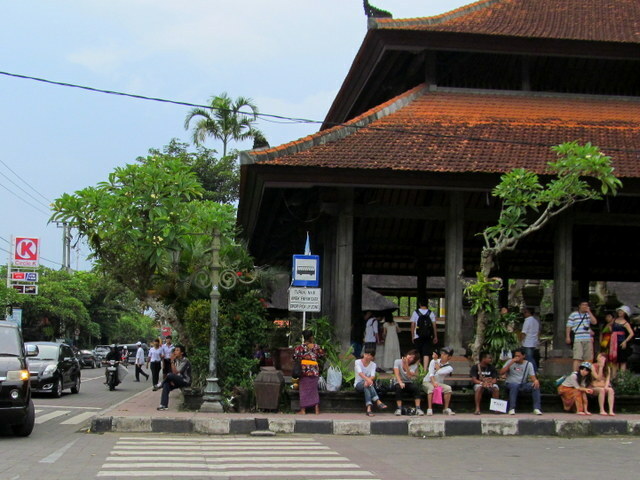 Previous The Bully & Mr G.
When I was here a year ago I never saw women and children begging in the streets of Ubud. Now there are increasing numbers of them. And this is the first I’ve heard of anyone, male or female, without a roof for the night. Does anyone know what is happening here? I would guess mental illness. Sometimes people with various kinds of psychosis become so paranoid they can’t bear to be around their families. Absolutely. You’ll just have to see. There is a man who lives not far from me under a bridge. He collects plastic bags. I feel pretty sure he must be psychotic. I think my smile helps. But who knows? He smiles back. Sometimes a smile is all they (and we) need… and a few words too. Who knows? I suppose we can’t always give people what they need, but that doesn’t mean we can’t still help.